1911 – First naval aviation base established at Annapolis, MD. 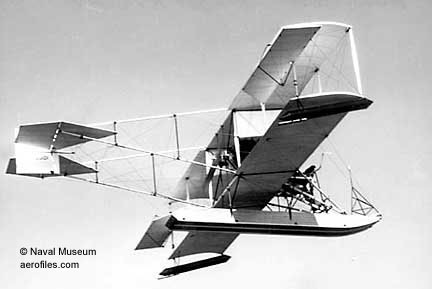 1911 – Trial of first Navy aircraft, Curtiss A-1. The designer, Glenn Curtiss, makes first flight in Navy’s first aircraft, A-1, at Lake Keuka, NY, then prepares LT Theodore G. Ellyson, the first naval aviator, for his two solo flights in A-1. 1920 – Test and first use of radio compass in aircraft off Norfolk, VA.
1926 – Distinguished Flying Cross authorized by Congress. 1937 – Amelia Earhart disappears in Pacific. Navy conducts extensive unsuccessful search. 1946 – Establishment of VX-3 to evaluate adaptability of helicopters to naval purposes. 1950 – USS Valley Forge and HMS Triumph participate in first carrier action of Korean Conflict. VF-51 aircraft (Valley Forge) shoot down 2 North Korean aircraft. The action is first combat test of F9F Panther and AD Skyraider. 1916 – North Carolina is first Navy ship to carry and operate aircraft. 1921 – Congress creates Bureau of Aeronautics to be in charge of all matter pertaining to naval aeronautics. 1945 – 14 carriers from Third Fleet carriers begin air strikes on Japanese Home Islands which end 15 August. 1952 – Laying of keel of USS Forrestal, the first 59,900 ton aircraft carrier. 1953 – United Nations Fleet launches heavy air and sea attack on Wonsan; Major John Bolt, USMC becomes first jet ace in Marine Corps. 1960 – USS Wasp departs Guantanamo Bay to support United Nations effort to calm the newly independent Congo. 1990 – Commander Rosemary B. Mariner becomes first woman to command an operational aviation squadron (VAQ-34). 1920 – Naval aircraft sink ex-German cruiser Frankfurt in target practice. 1927 – First organized dive bombing attack in combat by Marine Corps pilots against Nicaraguan bandits who were surrounding U.S. Marine garrison at Ocotal, Nicaraguan. 1943 – German submarine shoots down K-47, the first and only U.S. airship lost during WW II. 1945 – First atomic bomb test at Alamogordo, NM. 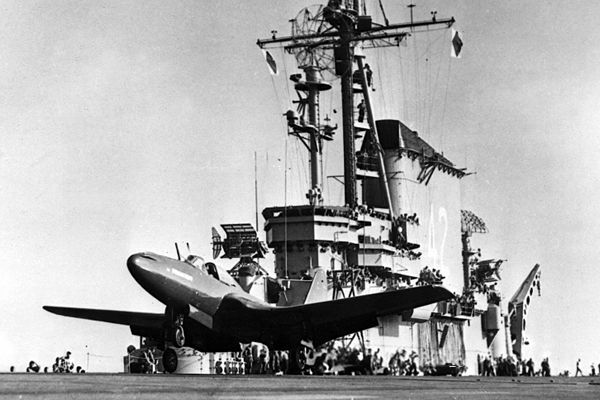 1946 – In first U.S. test of adaptability of jet aircraft to shipboard operations, XFD-1 Phantom makes landings and takeoffs without catapults from Franklin D. Roosevelt. 1974 – Evacuees from the coup on Cyprus arrive on board Navy vessels in the Mediterranean. Operation ended on 24 July. 1947 – First Navy all jet squadron (VF-17A) receives its first aircraft (FH). 1950 – USS Boxer sets record crossing of Pacific to bring aircraft, troops, and supplies to Korea at start of the Conflict. 1966 – Launch of Gemini 10 with LCDR John W. Young, USN as Command Pilot. Mission involved 43 orbits at an altitude of 412.2 nautical miles and lasted 2 days, 22 hours, and 46 minutes. Recovery was by HS-3 helicopter from USS Guadalcanal (LPH-7). 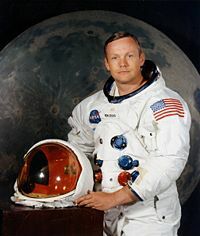 1969 – Former Navy pilot Neil Armstrong is first man to set foot on the moon. While taking the first step, he said, “That’s one small step for man, one giant leap for mankind.” Armstrong was Commander of Apollo 11 which during its 8 day mission landed on the Sea of Tranquility. Recovery was by HS-4 helicopters from USS Hornet (CVS-12). 1975 – Docking in spaceof the U.S. Apollo (Apollo 18) and Soviet Soyuz (Soyuz 19) space craft. This was the first manned space flight conducted jointly by the 2 nations. 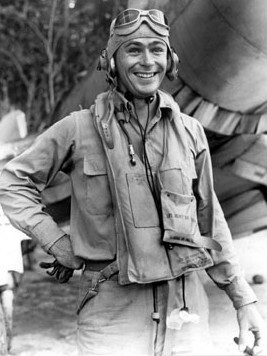 Former naval aviator Vance D. Brand was the Apollo Command Module Pilot. The Apollo craft was in space for 9 days and 7.5 hours. Recovery was by USS New Orleans (LPH-11). 1993 – Sarah Deal becomes first women Marine selected for naval aviation training. 1912 – First specifications for naval aircraft published. 1912 – First attempt to launch an airplane by catapult made at Annapolis. 1918 – Units of First Marine Aviation Force arrive at Brest, France. 1953 – Koean War armistice signed at Panmunjon, Korea and Korean cease-fire went into effect at 10:00 PM. 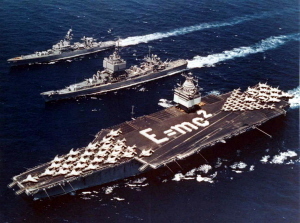 1964 – All-nuclear task force with USS Long Beach, USS Enterprise, and USS Bainbridge leaves Norfolk, VA to begin voyage, Operation Sea Orbit, to circle the globe without refueling. They returned on 3 October. 1973 – Launch of Skylab 3, the second manned mission to the first U.S. manned space station, was piloted by MAJ Jack R. Lousma, USMC with CAPT Alan L. Bean, USN as the Commander of the mission and former Navy electronics officer, Owen K. Garriott as Science Pilot. The mission lasted 59 days, 11 hours and included 858 Earth orbits. Recovery by USS New Orleans (LPH-11).